The Meent is a pleasant metropolitan street between the Coolsingel boulevard and the Goudsesingel in the centre of Rotterdam. Along the 800-meter-long street shops, cafés and restaurants can be found. The various café terraces lighten the atmosphere in this street, especially in the summertime. 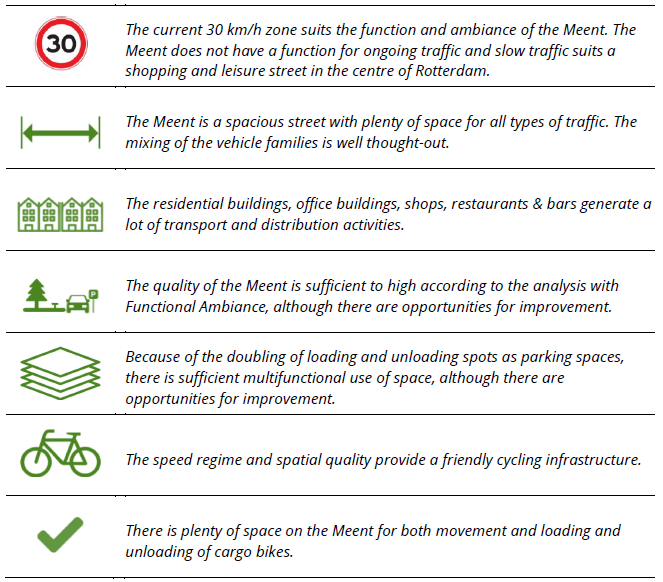 On the Meent, a wide range of traffic flow can be observed: pedestrians, cyclists, cars and trucks. Dynamic loading and unloading spots are introduced to aid in the final step of transport. These spots double as parking spots outside of working hours. This is a good first step in introducing the multifunctional use of space. This place has a functional character. It can be described as a place where slow flows of traffic interact with a pleasurable place. Especially the function as a place to shop, leisure and meet should come first, and it does. Wide footpaths and an easy to cross road facilitate this well. The ideal picture of the Meent is a design with two domains. The sidewalk is physically separated from the roadway. The space on the road is shared between cyclists and light motor vehicles, in which, the latter one is the design vehicle. 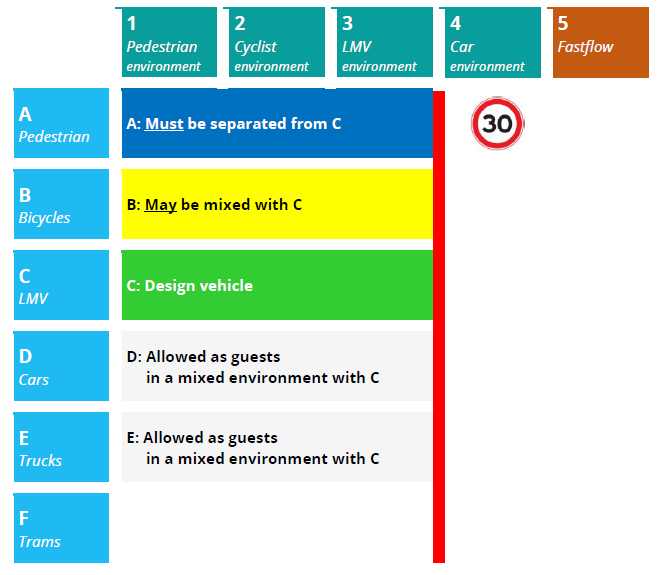 Cars and trucks are allowed as guests and thus should adjust their behaviour accordingly. The current speed regime of 30 km/h is the best fit for this layout. 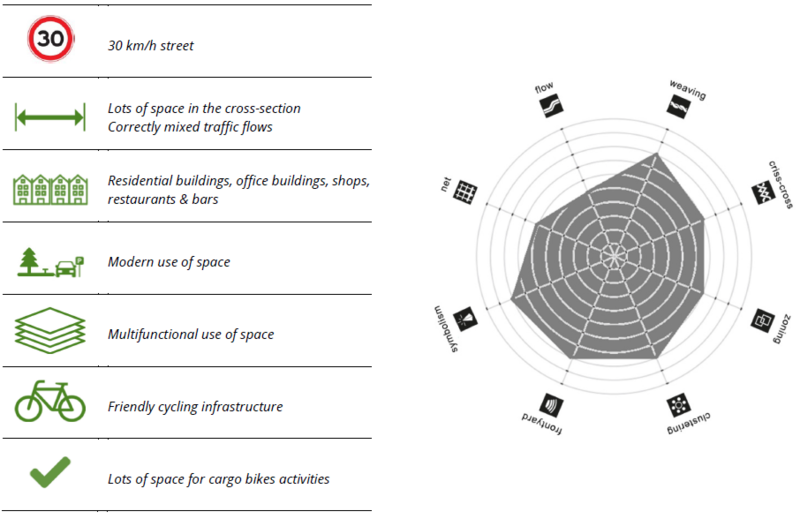 The relationship between traffic and public space is already partially dynamic as the loading and unloading spaces double as parking spaces outside business hours. The quality could be enhanced further if this space is given back as public space in the evening. In that case, it could be used as an expansion of the terraces or for other goals. It appears, from the scoring of the quality aspects of Functional Ambiance, that the quality of the Meent is very high. Even all the individual aspects appear to have sufficient quality. Further development is possible in the quality of public space. The number of trees is sufficient, admittedly, but the street would benefit from an increase in natural elements. There is enough space available to boost the experiential value without compromising the character of the street. Additionally, extra loading and unloading spaces and new parking places for bikes could also be added. This way these activities can be completely banned from the street and the footpath. The pedestrian domain could then become the domain of pedestrians alone.